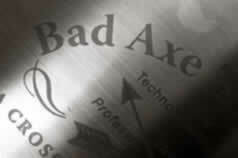 Bad Axe Tool Works - Why Choose a Bad Axe? "I couldn't put it down. What started as a series of test cuts turned into two complete projects overnight." "This saw cut with ease, accuracy, and speed. Bad Axe will size the handle and suit the appearance to your preferences. This saw is my top choice, with the highest marks from most reviewers. One called its performance in both cherry and oak 'amazing overall.' Another said, 'This saw cuts like you imagine a dovetail saw should cut'." ". . . game changing!!!" Bad Axe Saws are the absolute standard of equality--and damn, are they sharp! 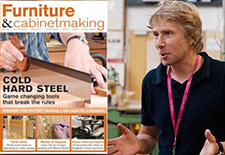 For joinery applications in furniture and cabinet making, the Stiletto and Bayonet are a deadly combination. The shallow backs and long plate length adds balance and control you simply don't get from deeper saws. Every furniture maker that uses backsaws should consider this duo." "If Bad Axe saws were motorcycles, we think they would be Harley-Davidsons. 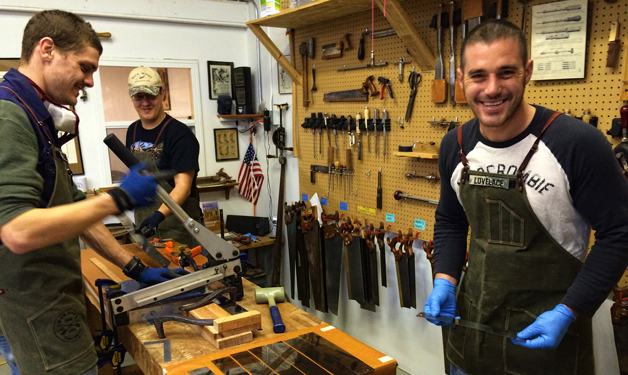 The craftsmanship on these saws is incredible." "Everything Mark Harrell touches is a game-changer." "If there is any remaining question in the hand-tool world regarding the all-around capabilities of carcase saws, Mark Harrell has offered a definitive answer with the introduction of the new 14" Bayonet Precision Carcase Saw from Bad Axe Tool Works." "My Bad Axe saw makes cutting a straight line as easy as it is to draw one." "Mark is the first sawmaker who has gotten me to put my rip dozuki on the shelf and leave it there." 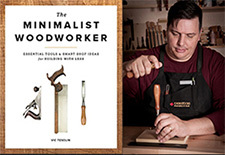 — Rob Porcaro, Woodworker, Author, and Blogger for Heartwood Blog. 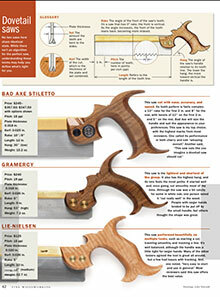 The Bad Axe Difference: understanding how we make the world’s finest saws. Sized handles guaranteed to fit your hand. Traditional Folded Sawbacks that prevent kinking your plate and allows you to retension your toothline at will. Static backs and friction-fit backs keep production costs down, but don't begin to compare to the survivability of a traditional folded sawback. Hammer-set toothline that precisely locks in a kerf width most appropriate to the plate gauge, a hugely underrated facet of a properly-tuned saw. Legendary sharpening excellence: cut with a Bad Axe for the first time and compare it with anything else. Go ahead--we don't mind the competition. Just make sure you cut into a section of quality hardwood, like quartersawn white oak. Anything will plow through pine. We refuse to rest on our laurels. We consistently earn top ratings from the woodworking magazines, but our philosophy is we're only as good as the last saw that ships through our doors. At the end of the day, with a Bad Axe you get exactly what you pay for: a tool of uncompromising quality, strength and endurance that outperforms any other saw on the market today. Learn more about how Bad Axe's Disstonian ethos drives every design decision we make. Cheers! 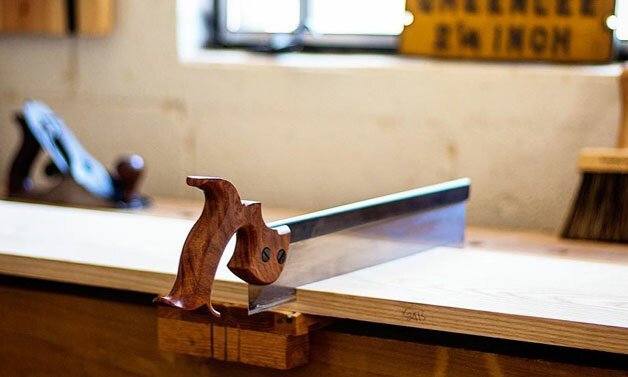 Classic 19th Century Design: I personally believe, after restoring thousands of vintage saws, that sawmaking reached its absolute zenith of quality during the American Reconstruction period following the Civil War up to the turn of the last century. I decided at Bad Axe’s inception to base our designs largely on patterns established long ago by Disston & Sons and the Wheeler, Madden, Clemson companies, and the kind of saws they produced in the late 19th century. That was back in a time when craft matched the need for production to serve the need of a rapidly expanding country, and livelihoods depended on the quality of a robust tool to compliment the craftsman’s steadfast adherence to quality. You’ll still find saws made by Disston, Simonds, Atkins, and Wheeler, Madden, Clemson available today online. That these saws are still around after a century of hard use bear testament to the commitment to quality their makers imbued in every step of production—and this is the philosophy Bad Axe brings to the table today. Quality of Materials: A chef at a five-star restaurant will be the first to tell you that quality begins with the finest ingredients. Likewise, your Bad Axe composes of the finest components in wood, metal and finish. Handle Lumber: There is a beauty in the way mesquite practically glows in your hand, or the way apple (when we can source it), handles comfortably like your favorite pair of blue jeans. We carefully select and purchase premium-grade lumber from trusted sources who share our outlook on uncompromising quality; only riftsawn/quartersawn stock will do, because wood moves with seasonal change. We source only woods native to the North American continent, reflective of our cultural heritage, and with a close eye tuned to companies that practice sound and sustainable harvesting practices. Fasteners: We source our fasteners through a US-based and privately-owned company equipped the latest Swiss turning technology. We stock all our fasteners in brass, stainless, and in 4140 gunmetal alloy for our nickel-plated, black-oxided, and niter-blued options. 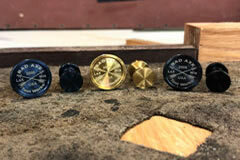 We laser-etch our logo onto the fastener medallion to achieve the same marking imperatives from the 19th century. This diverse array of choices enables the customer to color-code metals and finish with our equally broad handle species in accordance with the customer’s personal aesthetic. 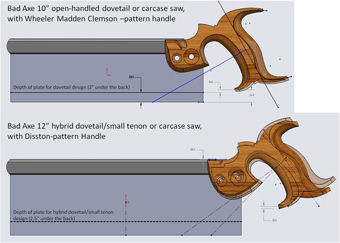 Sawbacks: Our sawbacks follow the time-tested folded design, and are sprung onto the spine of the sawplate. 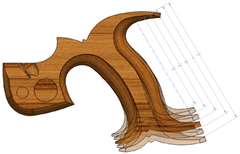 Unlike a glued-on static sawback prevalent in the market today, our traditional folded sawback enables the user to retension the toothline at will, and forgives inelegant saw technique, similar in intent to the way a ski binding will release a ski in a fall to avoid serious injury. Take a moment to review our retensioning procedure on YouTube, and you'll see how easy it is to maintain a Bad Axe. Ours are available in a variety of metals and finishes to serve the customer’s vision on how their saw should look and feel. 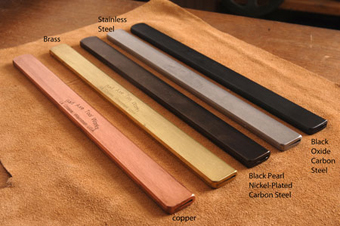 We offer brass and carbon steel alloys finished in black oxide, bright nickel, black nickel, and copper-plating for our saws. Will one finish or alloy trump another in terms of performance? Absolutely not—but you may be confident knowing that the sawback you choose is based on the traditional folded design, which allows you to completely disassemble your saw for maintenance, prevent kinking through awkward handling, and retension the toothline at will. Sawplates: We source fine Swedish high-carbon Spring Steel with a Rockwell hardness rating between 49 and 52, and tape our plates with a high-grade, low-tack metal protective film during the fabrication process to avoid unsightly scratches. One of the most important things we do at Bad Axe is to help the customer identify the proper plate-gauge and filing germane to their woodworking objectives, rather than blindly adhering to the latest fad or gimmickry in filing. We also laser-etch our logo onto the plate, following traditional marking practice established centuries ago by sawmakers worldwide. Customer-Driven Customizing: Aesthetics ARE important. 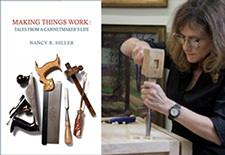 How a tool looks is something the craftsman will care about long after the initial purchase, and serves to reflect the owner’s personality and commitment to excellence, long after the saw is passed down to the next generation. We offer an array of wood species, handle sizes, metal alloys, and finishes to the customer, and allow the customer to choose how they want their saw to look and feel in their hand. Likewise, we correspond directly with the customer to help them decide which plate-gauge, pitch and filing will most closely dovetail with their woodworking requirements. We take great pride in our accessibility to our customer-base, so we can deliver to them what THEY want AND need. Traditional Folded Carbon Steel Sawbacks: Our carbon steel sawbacks are folded and sprung onto the spine of the sawplate, and are therefore not static. Period. What does this mean? Well, in the words of Paul Mayon from The New English Workshop. . . .
"it means that if you do come a cropper with your back saw and kink the blade, that it is repairable. Bad Axe saws are made this way (as, I believe, are Wenzloff). 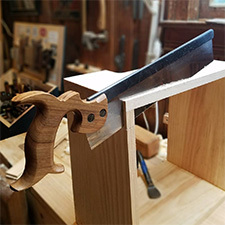 All other premium grade saws that I know of have their sawplate epoxied into a machined slot in the back which makes them effectively irreparable." Frankly, making a traditional folded sawback is an expensive process, based on design practices established centuries ago. Brass is inherently weak. It looks fabulous, and it's easy to fold, but all one has to do is look at any vintage brass-backed saw from yesteryear and compare it to the resilience of a steel back from the same era to see the difference in how it forms and keeps a tight compression fit on the spine of a sawplate. Brass does work well with a static-back, where a slot is milled along the underside of brass bar stock, and epoxy and/or pin the sawplate into place, making for a fixed solution. While this is a perfectly serviceable method of attachment (and lowers production costs to boot), the static sawback leaves no room for error if the plate is accidentally kinked in use through poor handling. It is a little known fact that the traditional folded sawback allows for minute slippage if the plate is kinked in use, and also allows the user to retension the toothline at will (note my video demonstrating sawback retensioning here). "Think of the traditional folded sawback as a ski binding that releases your ski and saves your knee's ACL in a nasty fall. Because a traditional folded sawback is sprung onto the spine of the plate, the plate will slip under duress before it kinks, requiring only a simple retensioning process to make arrow-straight again. 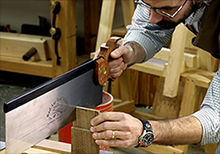 It's why vintage backsaws originally made well over a century ago still proliferate eBay today--it's a time-proven design that simply works. "Static-backs are a recent invention from the past twenty years. Though they will make a sawplate rigid, the epoxy bond sealing it into the slit milled along the underside of brass bar stock will over the long haul decay and promote a rippling effect along the toothline. And should you stress the plate through 'inelegant' saw technique we're all guilty of from time-to-time? Imagine the effect of gluing your boots onto your skis with no bindings, and you will achieve the same result with your ACL that happens to a sawplate glued into a static-backed saw." 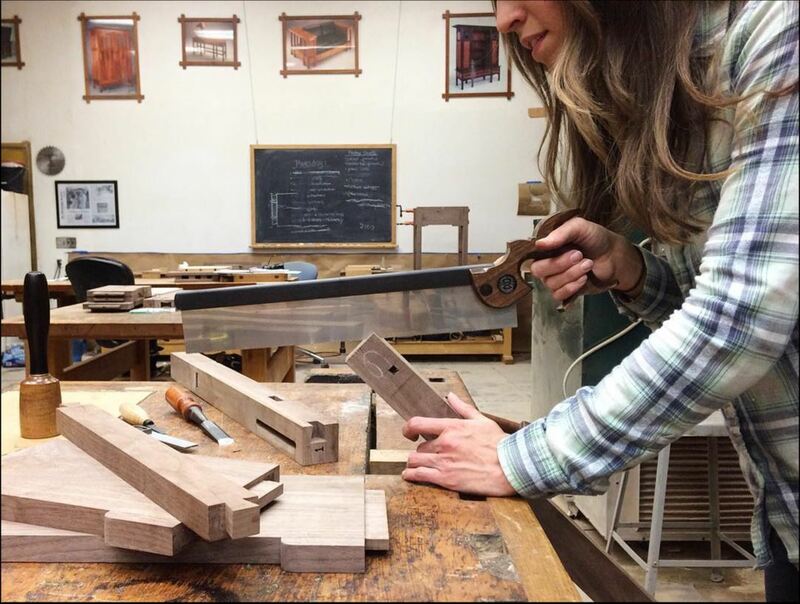 All backsaws were made in this manner until about 20 years ago, when the hand tool market reemerged worldwide. It immediately became apparent to many new sawmakers at that time that replicating the traditional-folded sawback was an expensive process. 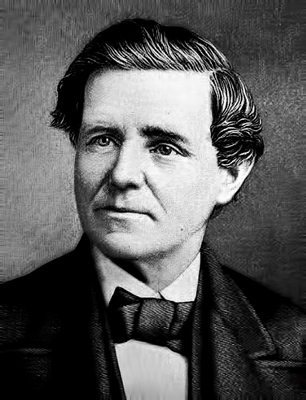 A cost-effective solution soon emerged as sawmakers would mill a slit along the underside of brass bar stock, and gluing the plate into the slit with epoxy. This has proven to be a workable and cost-friendly solution that in turn kept costs low for the customer. The downside? Brass is weak. And you're going to live with what you do to a static-backed saw through hard use when eventually the epoxy securing the plate in the slit decays over time with the constant tug of cut-friction between the plate and sawback as you work the saw. And that is precisely why Bad Axe incurs the additional expense necessary to create backsaws with the traditional-folded carbon steel sawback that Henry Disston championed throughout his company's existence. But there's no denying that brass looks good--it's a traditional, aesthetically pleasing look. Bad Axe therefore offers Titanium Nitride (TiN) plating for our carbon steel traditional-folded sawbacks. TiN is an incredibly corrsosion-resistant (superior to stainless), hard-wearing, firearms-grade plating that optimizes both form and function to the highest degree. TiN even case-hardens the carbon steel sawback, resulting in an even tougher solution for the traditional folded sawback that will make your saw look as good a hundred years from now as the day you bought it. At the end of the day, you get what you pay for. Bad Axe's commitment to quality and traditional design delivers to you a superior sawback that has stood the test of centuries. Our adherence to traditional design—like the Disstons, Simonds, and Atkins still around today—is why your Bad Axe will still be around long after the static-backed saws are discarded and forgotten. Handles Sizing, Fit and Finish: Like footwear, hands vary considerably in size. We mill our handles to about the 70% completion state via CNC, so that we can produce repeatable sizing across our family of handles on a predictably accurate basis. The handles are then carefully contoured and sanded with a variety of hand and power tools, followed by a thorough soaking in a high-end oil treatment. Afterwards, the handles are buffed out with carnauba wax before assembly onto a saw. The result? You get a handle based on a classic design from the late 19th century, sized to fit YOUR hand, and finished with oil and wax so that you, the customer, may periodically fix a ding without having to strip the handle and start all over again. Sawplates Gauged, Sized & Toothed Appropriate to Design & Purpose: As one selects a hand plane sized to fit the task at hand, we will help you identify a sawplate sized, gauged, and toothed to most effectively suit your task at hand with incredible flexibility to boot. 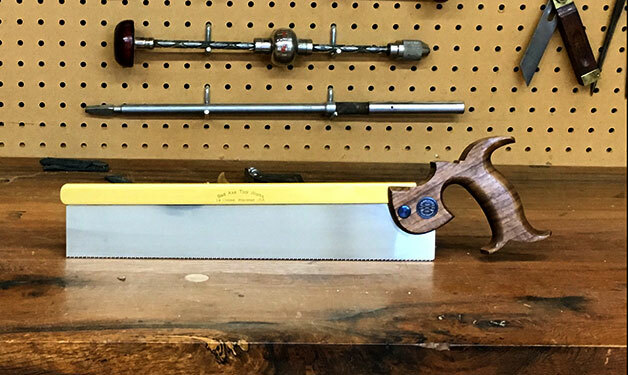 We occasionally receive requests for a super-thin .015-gauge DT plate or a canted tenon saw plate from novice customers based on what they have read, rather than truly knowing why. On the opposite end of the spectrum, we receive requests for our thickest .0315-gauge plates based on a perception that thicker is always better for more robust requirements. What matters the most is helping the customer understand what they need, rather than blindly giving them what the plethora of spilled ink out there may indicate what they want. We just don’t follow fads or gimmickry. We always guide our customers toward a plate size, gauge, and filing most appropriate for what they want to do the most with their tool, with an eye toward flexibility for requirements that stretch the boundaries. Hammer-Setting and Sharpening Excellence: Bad Axe hammer-sets and properly joints a toothline filed to purpose. We Americans in particular are obsessed with the latest technique, concept or technology to make something better, , I’m no different. But I will tell you that the best thing we do at the shop is that we sharpen in accordance with the basics. We do this not just well, but incredibly well: Joint. Rake. Fleam. Basic tooth geometry to fit the task at hand. These are classic, time-proven concepts on how to tune a toothline up to optimal performance. We don’t do progressive pitch, or deliberately dull the first inch or so of a toothline. We simply sharpen a toothline incredibly well. We’ll relax the rake on the toe end of the toothline to make the saw easier to start on the push stroke. As for joint? Put a ruler on our toothline to spot-check us on joint, and compare that to another saw, and you’ll see what I mean when I say every tooth along a Bad Axe toothline severs woodfiber, and not just half of them. Notice how our saws track like they’re on rails? That’s because we hammer-set our toothlines—actually coining metal into set through a hammer and anvil—rather than bending them into set with plier technology, such as the Stanley 42X. Look at the break line where we have established a hammer set on every tooth, and you’ll see a toothline that has a precision set about halfway up the tooth, and not bulging awkwardly in the gullet, a common indicator of a power set. This is why a Bad Axe will track a line like it’s on rails, and why you feel progressive cutting action with every stroke. You can hear it cut, crisp and precise—and feel that horsefly buzz singing up your arm while putting your saw to work. This is why our customers always come back for more. Ease of Maintenance: What use is a tool you cannot completely break down for maintenance and put back together? Just like tearing down an old $5 Bailey No. 4 Smoother, you should be able to take your backsaw completely apart if, God forbid, it begins to corrode or it gets banged up through an accident or unintentional neglect. This is again where the traditional folded sawback comes into play. Our website procedurals show how you can easily and completely take apart your Bad Axe for maintenance, and put it back to gether—and in the process retension the toothline. Don’t do this, however with a static-backed saw—you’ll ruin the bond where the plate is glued into the milled slotted sawback. For those of you who'd really like to get into the weeds on breaking down, maintaining, reassembling and retensioning one of our backsaws, be sure to download my article on 'Demystifying the Traditional Backsaw'. Nominal or Free Resharpening Fees. People often believe they must resharpen a saw every few months or so, and that’s just not the case. A saw, properly sharpened will last a couple of years’ heavy use. For weekend sawyers, four years or more. It all depends. So you run your toothline into an embedded nail, or you let a friend cut up some synthetic flooring with your Bad Axe . . . just send it in, and we’ll only charge you for shipping and $15. Pretty inexpensive. But it’s a Bad Axe, and we know our saws. Purchase a hybrid-filed saw, and should you ever want it resharpened to dedicated rip or dedicated crosscut, we’ll do it for free with the purchase of another Bad Axe. Shorter Delivery Time: I find no romance in crafting one saw a week as a starving artist, and don’t particularly care for the term boutique sawmaker. Our goal is to have the saw you custom-design and order in your hands within a month of purchase. We’re not quite there yet, but we are consistently turning saws around within 8 weeks of ordering, and often times under 6 weeks. Why? 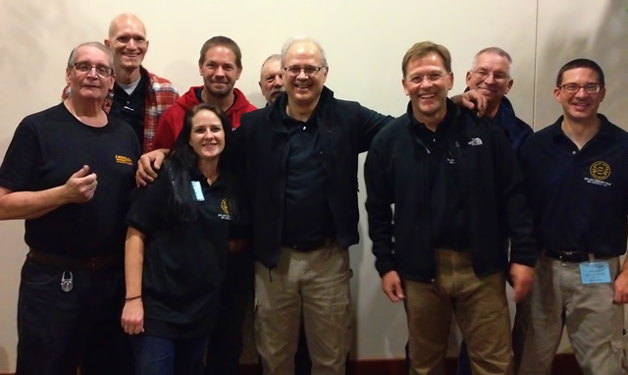 Because saws are our focus, and the Bad Axe team consists of highly motivated people, all of whom share the underlying ethos that excellence simply isn’t optional. Because we are a team, and because we work closely with our suppliers, we are able to field the best saw available anywhere in a reasonable amount of time, without the customer having to wait months, even years for a custom-designed saw tuned to suit their personal aesthetic and specified requirement. Customer Service: We’re only an email or a phone call away. Unsure which saw to get first, or perhaps you’re on a budget, and can only afford one saw for now? Then I’m glad to talk it over with you, help identify your most important requirement, then get you into a saw that offers you the biggest bang for the buck. Want to change your order around? No problem. It MAY delay shipment by a week or two, but we are not inflexible. Want to add another saw to your original order before we’ve shipped your original order? No problem there either, and we won’t charge you additional queue time; instead, we’ll gang everything together under the original order. 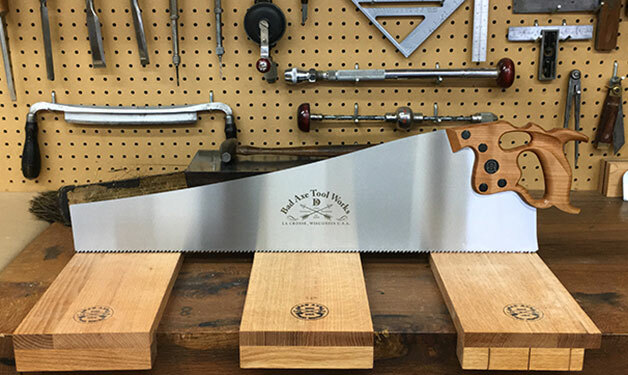 The thing is—we here at Bad Axe are in the business of not just selling saws, but to just absolutely blow you away with our commitment to quality and customer service on top of delivering the most amazing saw you’ve ever owned. That’s not hyperbole—that’s a promise. I expected no less from an American toolmaker before I went into business, and I damn sure expect it of myself and the rest of the Bad Axe team.. The Bad Axe Lifetime Guarantee: it’s real simple: we guarantee our materials, workmanship, and a drift-free, wonderful cut for life. Now—does that mean I’ll fix your horn for free if you drop your saw? No. If you run it over a nail, I’ll still charge you $15 to resharpen the saw. There is an honor system in place. But if you don’t like the way the saw you purchased from us, based on material defect, or that it doesn’t cut the way it should, then send it back to us. If we dropped the ball—and sure, we can make mistakes like anyone else—then we will own that mistake and correct it free of charge, or refund your money. Case in point: a customer told me the neck of his open-handled saw cracked while he was simply sawing. Turned out there was a flaw in the wood none of us could see, because it was hidden under the surface. We replaced the handle, trued up the components, and returned the saw to the customer within a week. Bottom line: we stand by our work—and when you pay a premium for one of our saws, we own anything that’s on us to make right. Period. We like keeping happy customers in the fold, and the last thing we’re ever going to do is try to weasel out of a problem if one ever develops. So when we say . . . Strength. Craft. Endurance--what we're really hanging our reputation on is that our saws will stand the test of time. You'll reach for a Bad Axe time and again, because it cuts so incredibly well, fits like a glove, and looks so damn good to boot. Based on sound, traditional design, this is a saw that will be passed down the generations of your bloodline--because it's quality. And quality sells. Quality lasts. 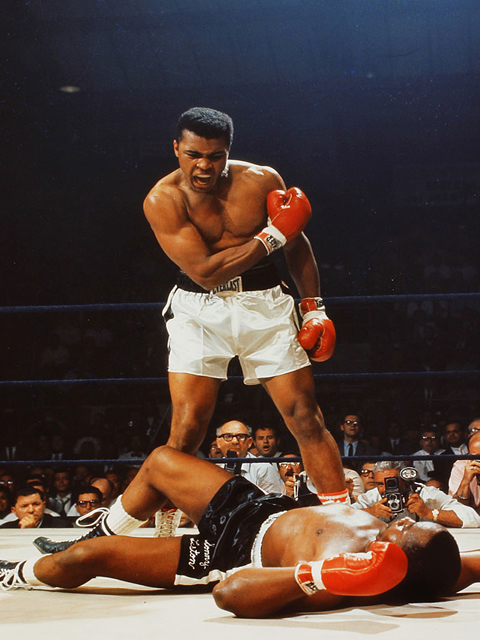 "It ain't braggin', if you can back it up." Why Choose a Bad Axe? – Bad Axe Half-Blind Dovetail Saw New! – Bad Axe Finished Kerfing Plane New! Prioritizing your saws Read Me! Saw Files and Handles New! How to Maintain your Bad Axe Saw New! Is My Saw Worth Tuning Up?